Elizabeth Estelle Burdon is a high school student from West Yorkshire, England. Lizzy has always loved reading, as she finds in it a way of escaping reality and book characters will always be her friends. This passion only grew as she got older. When she was 7, she read the Harry Potter series for the first time and that was when she decided she wanted to be an author. She had hundreds of ideas already going round in her head, and when she was at High School she decided to put the most developed of these into words. She’d had the idea while using an app to teach herself German (she loves languages as well and speaks French, Spanish, Mandarin Chinese, and a little Italian and German) and she was learning the months of the year. Then she suddenly had the idea - what if there were 12 sisters all named after the months of the year? The story developed very quickly from that point onwards. She spent a lot of her time thinking about it. It wasn’t long before she decided not to wait any longer – it was time to start writing her stories. So she started writing Fire and Ice in October 2016 and it was completed at the end of December that year. She continued to write and hasn’t stopped since! She still regularly has ideas for stories, at random moments – she had the idea for Rosanna in the middle of a history lesson! And she loves to tell these stories. 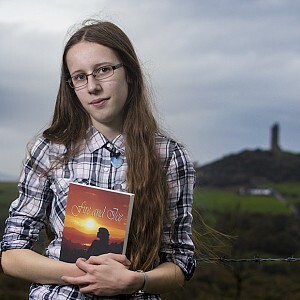 It wasn’t long before she decided to make her dream reality and publish her first book. Although no one actually calls her Elizabeth, she decided to put her full name on her books. It’s something she has in common with her favourite character from classic literature – Elizabeth Bennett. Although Jane Eyre is a very, very close second! And the name “Fire and Ice” for her first book simply came to her. She’d decided on that name for the book before she even knew why she was calling it that. She thought of the reasons later. And finally, almost a year after she started writing it, her book is almost ready to be published. Everything seems to be coming together. She is finally ready to become a published author. Lizzy hopes you will join her on her writing journey and that you will enjoy reading her stories as much as she enjoys writing them. Lizzy is now in year 10 at high school. She is a keen reader and a very determined writer. She has also written three of her own songs. Her real passion, however, is taking the many ideas in her head and making them into stories which she can tell. She has now written four novels and is currently working on a fifth. No matter what happens, she will never stop telling her stories.